Opened in the 1930s, Fairchild Tropical Botanic Garden (named after American botanist David Fairchild who traveled the world and brought more than 20,000 plants, including mangos, alfalfa, nectarines, dates, horseradish, bamboos and more, to the United States, settling in Miami around the same time the garden opened) is an 83-acre garden located in Coral Gables, Florida, just south of Miami proper. A museum, laboratory, learning center and conservation research facility, Fairchild Tropical Botanic Garden hosts festivals throughout the year and regular events for both members and non-members. The organization also has field programs in over 20 countries and is one of the most highly regarded conservation and education-based gardens in not only Florida, but the entire world. 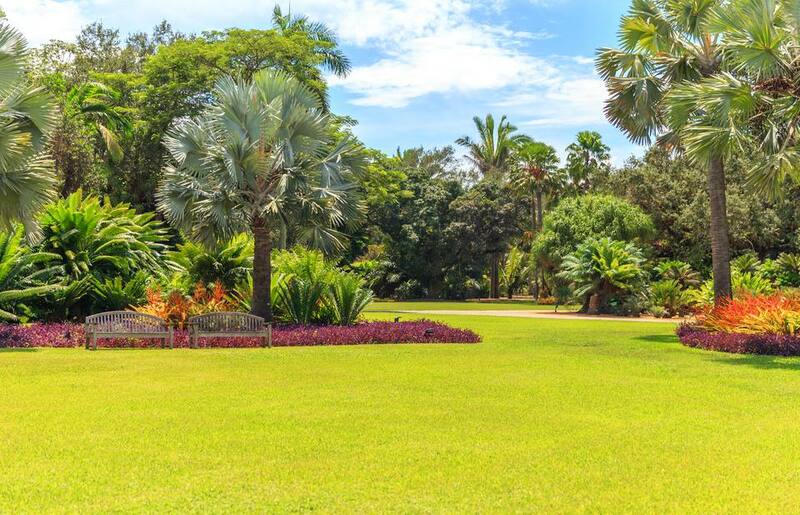 There are so many things to see and do at Fairchild Tropical Botanic Garden. Check out beautiful butterflies in the Wings of the Tropics exhibit. Take a moment to meditate amongst lush greenery, birds and a serene lake. You can take a guided (or self-guided) tour here, too. Hop on a tram hourly from 10 a.m. to 3 p.m. on weekdays. The trams run an hour later on the weekends. Tours are offered in both Spanish and English and last for 45 minutes. Check the website for tour schedules. Fairchild’s Simons Rainforest will transport you to a balmy place and the Whitman Tropical Fruit Pavilion will allow you to smell (and maybe even taste!) exotic fruits native to jungle climates. Fairchild Tropical Botanic Garden is open from 9:30 a.m. to 4:30 p.m. daily and the price of admission varies (members get in free; adults pay $25 each; there are additional discounts for students and seniors and children 5 and under also get in free). Anytime is a great time to visit, but it’s best to check the garden’s calendar of events online for activities like yoga in the garden, meditation, early bird walks, classes and plant shows/sales. As the home of the American Orchid Society, Fairchild hosts the International Orchid Festival, but that’s not all. If you like fruits and/or chocolate you can’t miss the annual International Mango Festival or the International Chocolate Festival. At each event you can sample specialty dishes and purchase plants, flowers, food, drinks and more inspired by cultures from around the globe. There are a few ways to get to Fairchild depending on if you’re headed north from the Florida Keys, south from Miami Beach or from another direction altogether. Plug the address into your GPS for a stress-free car ride. If you choose to take public transportation, you have plenty of options. Limited Miami-Dade Transit bus service is available to Fairchild in the morning and from Fairchild in late afternoon. Click here for Miami-Dade Transit information or call 305-770-3131. Weekend and holiday service may vary. Then, there is taxi service in addition to Uber and Lyft. If you’d rather call a cab, local taxi service is offered by Yellow Cab. The company can be reached at 305-666-6668. Our favorite mode of transportation to or from Fairchild Tropical Botanic Garden, though, is the bicycle. Take advantage of eco-discounts if you walk, ride your bike or take public transportation to Fairchild. You’ll get $5 off the admission price for adults and $2 off admission for kids. If you are a member an walk, ride bike or take public transportation, Fairchild will give you a Bike and Five punch card, which you can exchange for a $25 gift admission card (give it to your mom!) after five visits. The Lin Lougheed Spiny Forest of Madagascar is a delight to witness; here, you’ll view desert plants native to Madagascar and nowhere else in the world. Most are actually endangered, unfortunately. As the seasons shift, so does the Spiny Forest. Be sure to visit in winter and summer so you’re able to experience the best of both worlds. There’s plenty to do nearby, from malls and restaurants to Matheson Hammock Park, where you can go paddleboarding, boating or jet-skiing. If you stick around for dinner, Matheson Hammock Park has its own seafood restaurant called Redfish Grill. Down the street you have Dadeland Mall (Zara, Nordstrom, Macy’s, Saks Fifth Avenue) and then there’s also the Falls (Bloomingdales, Michael Kors, a movie theater and more).